next to a BulkTobac Box Barn. 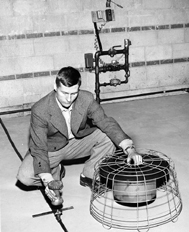 William P. Horne assembles a Gastobac Burner System®. BulkTobac® is a division of Gas-Fired Products, Inc. and is headquartered in Charlotte, N.C. The company was founded in April 1949 as Bright Leaf Industries and was originally involved in the manufacturing of gas fired tobacco curing equipment for the U.S. market. The company was started when its founder, Gilder Horne, designed and manufactured the very first gas fired tobacco curing system in 1946 while working for Rulane Gas Company. This system was developed to provide the tobacco farmer with a gas-fired system that replaced previous curing systems using wood as the primary fuel source. The major benefit was a thermostatically controlled burner system that automatically maintained the temperature in the curing barn. No longer did the farmer have to stay up all night to tend his barn. He now just set the thermostat and let the new system work while he slept. 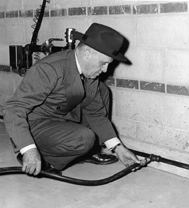 In 1948 Gilder Horne purchased the new curing system now called Gastobac® from Rulane Gas and in 1949 relocated the manufacturing part of the business from Oxford, NC to Charlotte, NC. During this period, Frank Horne, Sr. and William P. Horne joined their father in the business of manufacturing and distributing the patented Gastobac curers. Based on the success of the tobacco curing products and over the years, the company expanded into the manufacture of other gas heating equipment including industrial infrared heating products, poultry heating products, and space heaters. 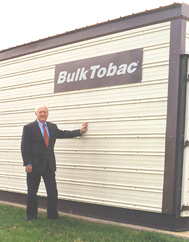 During the 1970s the tobacco division of Gas-Fired Products, Inc. adopted the trade name, BulkTobac, when it began marketing a new unique downflow type bulk tobacco barn. The first BulkTobac tobacco barns incorporated a patented, lightweight, easy to handle rack system for holding the tobacco, along with a powerful 500,000 Btu furnace system. In 1977 the company developed and patented an innovative automatic curing control system called a Delta T. Constantly being updated, the Delta T control system allows the tobacco itself to set its own optimum curing schedule. In 1989 BulkTobac developed a new box barn system with super high capacity fan and burner system. The focus of the box barn system was holding capacity and labor savings. BulkTobac barns are now available using either upflow or downflow curing methods. Adapted from previous oil fired furnace models, BulkTobac recently introduced their new HeatX heat exchanger conversion kits and furnaces. These systems can improve fuel efficiency up to 16% with a unique variable input rate which allows the farmer the option to adjust his Btu levels to his individual needs. Experience is what counts the most, and at BulkTobac we have been manufacturing tobacco curing equipment for over fifty (50) years. Our emphasis was then, as it is today, on safety, reliability and efficiency. When it comes to these three objectives, BulkTobac products have withstood the test of time.